A4 Class Union of South Africa passing through Killamarsh on Saturday 22nd December 2012. Copyright K Bone. 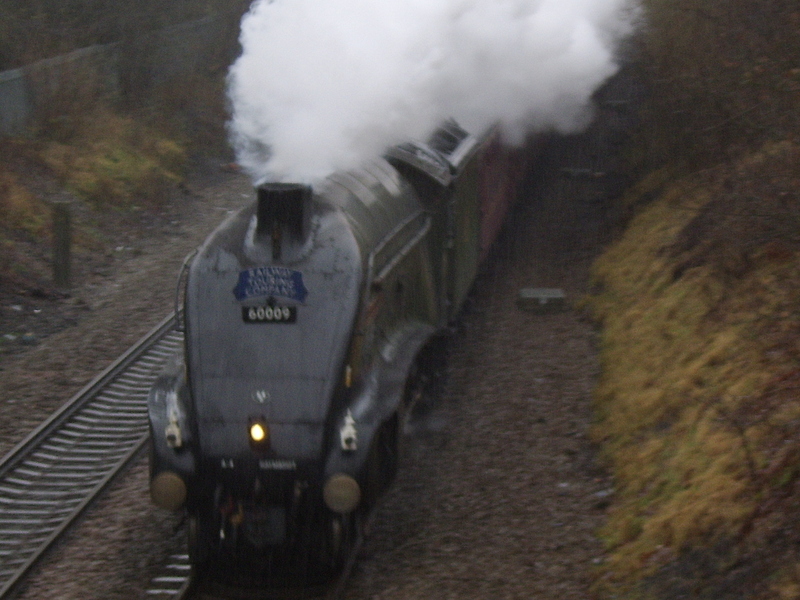 Despite the heavy rain we managed to get a reasonable photograph of Union of South Africa passing through Killamarsh on Saturday morning (22nd December 2012). The rain was coming down in torrents and I took this whilst holding on to an umbrella at the same time. The train was moving at a substantial speed so this is not to bad a shot considering the conditions. Also another train was due an hour earlier – GWR Castle Class 460 No 5043 Earl of Mount Edgecombe – whilst looking for a reasonable viewing point and realising there were too many trees, we went down to the Rother Valley at the time the train was due to go past, but were told it had arrived ten minutes early so unfortunately we didn’t get a shot of it. Who has ever heard of a train arriving early!